There is no smoke without fire! One more time, companies asked the help of the Justice to fight against Google. This time, the Google Suggest tool is the target. This service is quite simple and you probably use it on a daily basis. 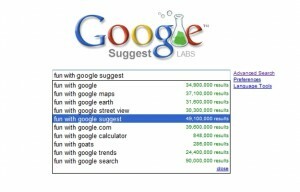 When you type your search terms in the search engine, Google offers keyword suggestions in real time. Google Suggest is certainly not bullet-proof and can sometimes give funny results. Funny or injuring results? Google has been convicted of injury by a French Tribunal (it looks like the French Justice is quite busy at the moment). The complainant company blamed Google to suggest a combination of the company name and the word “arnaque” (“scam” in English). After some months of fight between the parties, Google removed the association. I won’t join any side in this story. Google can be the worst evil and I don’t know this French company. But, there is no smoke without fire! If Google suggested this query, it means that the Google bots found some references in blogs and forums about this company and complaining customers. This reminds me the story of the Belgian jeweler who had a very bad publicity in the Internet a few months ago. When companies will realize that there is “live” on the Internet? Dad’s static website containing your filtered own information is over! Customers exchange information about your company on the Internet, potential customers looks for more information. Keep an eye on your online reputation!